I guess I was bored the other day so I decided to get high off nail polish and do my nails in my little room with just a bathroom fan for ventilation. 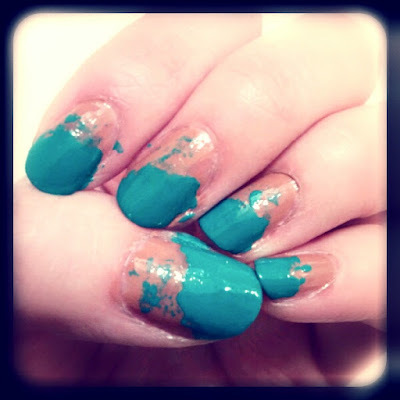 Possibly not the brightest idea and it probably explains this mistake turned inspired nail look. Using American Apparel's Nail Lacquers in Make Up for the base and then Malibu Green for the top layer, I cut out a thin roll of paper to act as a guide for the off-kilter top coat and then used the excess paint on that paper to sorta splatter the rest of my nails. At the time I thought I was being incredibly avant-garde and punk, but probably everybody else just thought I couldn't paint a straight line. Very cool! Have a great weekend. Wow. Super cool. Way to turn something bad into something funky and pretty. I've never seen this effect being done - very artistic! I personally love it, I think it's so different and it looks very intentionally raw-edged. LOVE those turquoise tones for spring!